In 2008, Hinchinbrook Shire Council commissioned Troppo Architects and Conics to give conceptual consideration to its Q150 Tyto Wetlands Community Project within the Ingham Township, to improve the amenity and visual appeal of the wetlands, adjoining parks and streetscapes, and create a tropical/vibrant theme to the area. This project is part of the Queensland Government’s Q150 Legacy Infrastructure Plan which aims to help boost trade and tourism in line with the 150th anniversary of the state’s independence from New South Wales. It has seen a man-made extension of the existing wetlands, a new cultural precinct (including a restaurant and multi-purpose centre), viewing tower, and a new ‘business incubation area’ designed to maximise exposure of new and emerging businesses to passing tourists. All of this is connected by scenic elevated boardwalks. The focal point of the Tyto Cultural Precinct is the unique wetland environment. 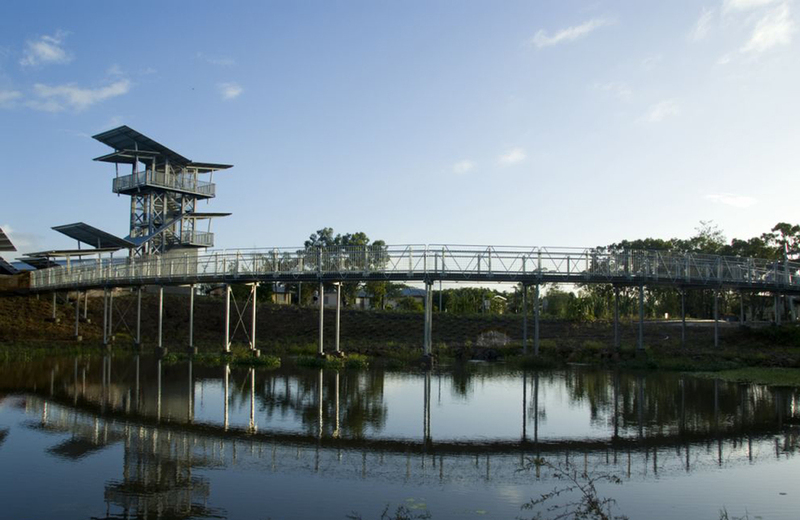 The new buildings and public space provide an interface between the urban edge of the Ingham, and natural edge of the Tyto Wetlands.